Paramount Floraville, A consistent amalgamation of extravagance, solace, and style mix to give away really modern outlook towards life. These Residential Apartments in Noida are wonderfully crafted bearing in mind all your needs. Paramount Floraville in Sector-137 is constructed by Paramount Group Of Companies, a customer friendly construction firm that always focuses towards delivering the best to its customers. Paramount Group Of Companies has gained the name and fame in constructing marvelous Apartments in Noida with the use of high-class building material that enhances the looks of the property along with increasing its life span. Paramount Floraville offers 2 BHK and 3 BHK Apartments at one of the prime locality in Noida. With proper ventilation and uncluttered wide space, Paramount Floraville makes you feel blissful right from the moment you enter in your beautiful Apartments at Sector-137. 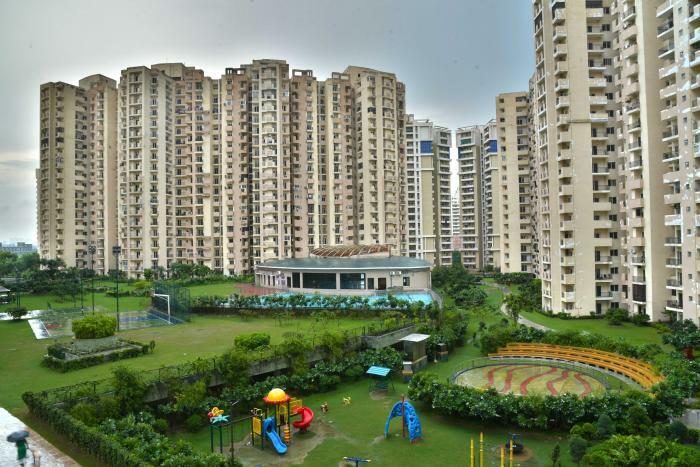 Paramount Floraville is one such property in Sector-137, Noida where luxury comes with affordability and the inhabitants enjoy the perks of living in one of the best localities of town. The Apartments in Paramount Floraville are deliberately constructed so as to provide easy access and transportation to other parts of the city by wide roads. The amenities in Paramount Floraville will definitely make your life pleasant. Some of the amenities installed within this property are Landscaped Garden, Earthquake Resistant, Swimming Pool, Gymnasium, Play Area, Intercom, Lift, Club House, Health Facilities, Tennis Court, Badminton Court, Wifi, Cafeteria, Car Parking, Fire Safety, Gated community, Maintenance Staff, 24Hr Backup Electricity, Basket Ball Court, Pucca Road, Service Lift, Street Light, Security, Fire Alarm and Fire Fighting System. Location Advantage: Paramount Floraville is strategically located at Sector-137 to give unmatched availability from all the vital areas and places of basic utilities such as hospitals,schools,supermarts, parks,recreational centers and so on. Paramount Group is a young and contemporary real estate company with an objective to create industry milestones. It has already established itself amongst the leaders and its projects are known for their unparalleled quality and unmatched style. Set up by the M.D., Mr. Mukesh Aggarwal 21 years ago, the company has grown from strength to strength under his tutelage. His endeavours have paid off great dividends in the form of immense growth and success to the company and its people. Strongly committed to excellence, we are associated with world renowned architects for quality control and project management, which has helped us in developing some of the most lively and modern buildings of the times. Review of Paramount Floraville, Sector-137? Its price, location, builder etc. Review of Paramount Group Of Companies, Sector-137? construction quality, trustworthy, delivery history etc.? Review of Paramount Floraville, Sector-137 location? neighbourhood, connectivity, schools etc.? Comparison of Paramount Floraville, Sector-137 to nearby projects? Is it rightly priced? What is your feedback on this Paramount Floraville, Sector-137? Depends on brand name and complete the project in time etc? Will this be a better option for investment or to live in Paramount Floraville, Sector-137? Can you give some suggestion? Is the Paramount Floraville, Sector-137 has more potential in terms of capital appreciation, ROI, Rentals, Proximity to social infrastructure etc?